For a challenging but rewarding day out in the Crianlarich Hills, tackle the mighty Ben More and its equally lofty sister, Stob Binnein. The huge conical mass of Ben More, seen as you approach from the east along the A85, looks formidable and daunting, especially if you can actually see the summit which more often than not is shrouded what appears to be its very own resident cloud. The twin peaks of Ben More and Stob Binnein rise to 3852 feet and 3822 feet respectively making them the 16th and 18th highest points in the land. Leave your transport in the car park on the southern shore of Loch Iubhair and follow the road to Benmore Farm. Take care crossing the carriageway and climb over a style at the roadside fence where a signpost points the way to Ben More. Decide at this point whether to tackle Ben More first - which involves an unrelenting haul up the frighteningly steep Sron nam Forsairean ridge - or Stob Binnein, which means a gentle walk along the Benmore Glen. We decided to avoid the leg-sapping direct ascent and follow the track which disappears into the glen alongside the Benmore burn. Walk towards the obvious corrie at the head of the glen for about four kilometres before leaving the boggy path and heading east towards the Bealach-eader-dha-Beinn between the two peaks. You will have to climb increasingly steep, grassy slopes to reach the bealach but there are one or two fairly indistinct paths which you may well be fortunate enough to intercept. Once on the bealach head due south past a couple of tiny lochans and pick your way up the steep boulder strewn slopes, a path is obvious here. Half an hour of steady walking should bring you to the tiny, tabled summit of Stob Binnein where a large cairn appears to sit on the very edge of nothing. On a good clear day the views will be astounding. On our visit, despite it being the middle of August, you could barely see 20 yards! Retrace your steps back down from the summit and cross the bealach to reach Ben More. An obvious path winds its way up through the heather and scree to the wonderfully exposed summit. Just before you reach the top a couple of climbing moves can be used to navigate a large boulder which appears to block the way. The obstacle can be passed if need be by taking a small diversion to the east. 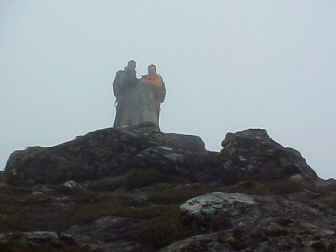 Care must also be taken on the summit itself if it is wet because the rock has been weathered smooth and is very slippy in places. 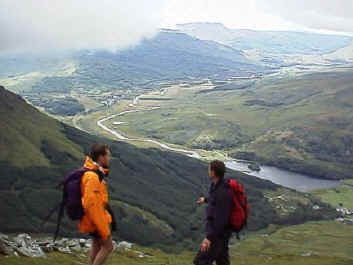 From the summit, descend via the mountain's northern flank avoiding the hanging corrie which is found immediately below the summit facing north west. This tends to avalanche in the winter and it's a long, long way down. As you work your way down the steep zig-zagging path take time to savour the views across Glen Dochart. The clouds just began to break and offer tantalising glimpses of the Tarmachans to the north east and Crianlarich to the west as we made our descent. Start/parking Car park on the A85 at Loch Iubhair. Grading A strenuous expedition regardless of how you tackle it. Ben More translates as ''big hill'' and they're not kidding! Suitable for experienced hillwalkers who are prepared to carry the proper equipment. No easy escape routes from the summits of either peak.